"Consequently, most objects that absorb visible light reemit it as heat. So, although an object may appear dark, it is likely bright at a frequency that humans cannot perceive." Can someone explain this to me in lay man's terms? Does this mean that darkness is really light? This quote is describing what happens when a photon of visible light strikes a material and is absorbed. An electron that absorbs the photon is excited - which means it moves to a higher energy state. Then, it eventually "falls" back down to a lower energy state, and in the process, emits another photon. This photon typically has a wavelength that is longer than the originally absorbed photon, which puts it outside of the range we can detect with our eyes and into the range that we can feel as heat - the infrared region. Does this mean that darkness is really light? To answer your question, we have to start with a solid definition of darkness. I like "darkness is the absence of light." Using that definition, then the answer has to be "no, because dark objects do not emit visible light." The confusion comes in when you start thinking about the full range of the spectrum. Typically, we think of "light" as "visible light" alone. But all light is electromagnetic energy, which is made of photons. And photons can have a broad range of wavelengths, some visible, and some not. The wikipedia quote is referring to this. They are bending (or maybe expanding) the definition of "darkness" to mean "does not emit photons." Since the object could be emitting photons in the infrared region (or ultraviolet, or radio, or anything other than visible) you could call it "bright" in that spectrum. Incidentally, radar works on this principle. Many objects that do not reflect photons in the visible region do reflect photons in the radio region very well. Is darkness really light? No. But not all light is visible to your eyes. You cannot see infrared light, because it is so "red" that your eye can't pick it up. But warm objects radiate it, which is why infrared cameras see warm objects. As objects get warmer, not only do they radiate more, but the light they radiate moves up the spectrum. First they glow red, then they glow yellow or white (like an incandescent light bulb, or the surface of the sun). If they get hotter still, they get bluish (like lightning or some stars). Hotter still, and they start making ultraviolet, and then X-Rays. The light we can see is just a tiny part of the whole electromagnetic spectrum, from plain old radio waves at one end, up to gamma rays at the other. The center of our galaxy is very bright in radio, near infrared, and gamma-rays, all of which we cannot detect without special instruments. In the optical band, the center of the galaxy seems like there are large patches of missing stuff (the dark blobs) that is "filled in" with emissions in other wavelengths. Mike Dunlavey's answer is accurate. But, I will try to add little more info on the topic. Your cat or dog can see things that are invisible to you because of UV detecting ability, a python can see things that are invisible to you because of infrared detecting ability. The cat, python, dog, most probably you will be thinking, why do we detect rays only of certain wavelength or frequency? why can't we see what others see? 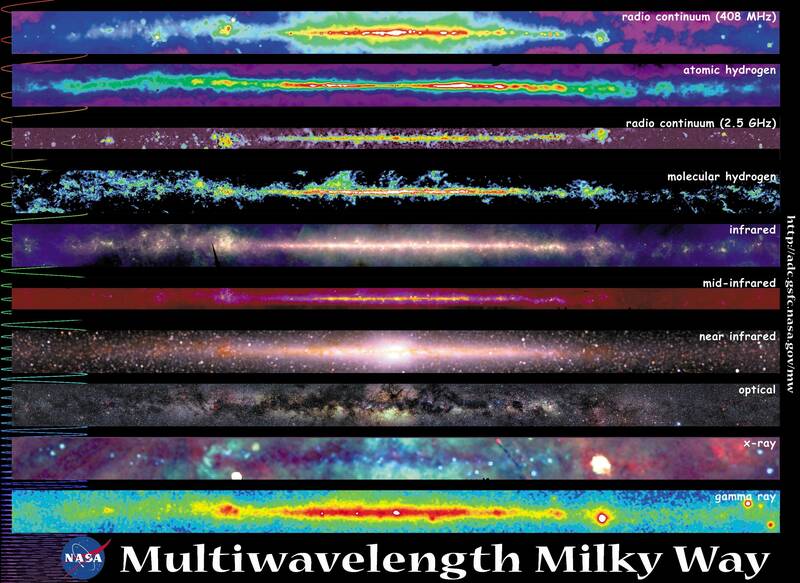 The waves of different wavelength or frequency are detected by different ways. For example, infra-red waves are detected by Thermopiles, Bolometer, Infrared photograpic film. The pythons use relatively the same principle to detect these waves and form images using pits, which are heat sensitive channels. UV or Visible light range is detected using photocells, photographic films. Relatively the same principle is used in detecting visible light using photochemical reactions in some of the animals. Similarly, different waves involve different waves of detection, the animals don't have all the privileges of detection. If you would had all the privilege, you can surely see what your animals can see. The simple answer is that all normal matter emits electromagnetic radiation through blackbody radiation. So, in a sense, there cannot be darkness. Any normal matter with any energy at all (above absolute zero by the most minute amount) emits blackbody radiation. (Start here http://en.wikipedia.org/wiki/Black-body_radiation and I'll explain more if you are interested). Perfect blackbodies (emissivity of 1.0 at all wavelengths) actually emit the entire electromagnetic spectrum. So "darkness" is not perfect at any wavelength. What about grey bodies? Objects that are not perfect blackbodies emit less power than the theoretical value at certain wavelengths. So, it is possible for an object to have an emissivity of 0.0 at certain wavelengths "disconnecting" it from the blackbody "grid" that connects us all. However, for an object to have an emissivity of 0.0, then it must have no absorption (lossless). What about dark matter? That is a conundrum. I was just at Caltech and asked this question of an astronomer. I got the answer I expected. Dark matter is "disconnected" from the blackbody "grid". It does not emit any blackbody radiation. So is there a place where darkness is absolute? Could be if you are inside a sphere or dark matter, there is no light at all. Otherwise, there are photons shooting all around you of all varieties of energy! Can it be absolutely dark on Earth? No way. All objects on Earth emit 9 - 12 um infrared light be virtue of being close to room temperature. Therefore LWIR "night vision" or thermal cameras (http://www.flir.com/cvs/cores/view/?id=51221) have plenty of 9 - 12 um photons to see in the darkest of night. Even more tantalizing are SWIR night vision goggles (http://www.sensorsinc.com/nightvision.html). The atmosphere glows in the SWIR (1.5 - 2.0 um) at night and creates illumination that can be seen with InSb cameras. These give images that look much more realistic than LWIR because the reflectivity in the SWIR is similar (not identical) to visible. the structure of human eye is delicate in nature, if the intensity of the light is very low, the things have no color. The adapted vision is almost entirely due to the rods and visions is bright light entirely due to cones. the remarkable shift between the dark and bright is purkinje effect. rods take over in the dark and our vision is not quite as acute when we look at one side and the no of cones decreases as we go farther to the side of the filed view. 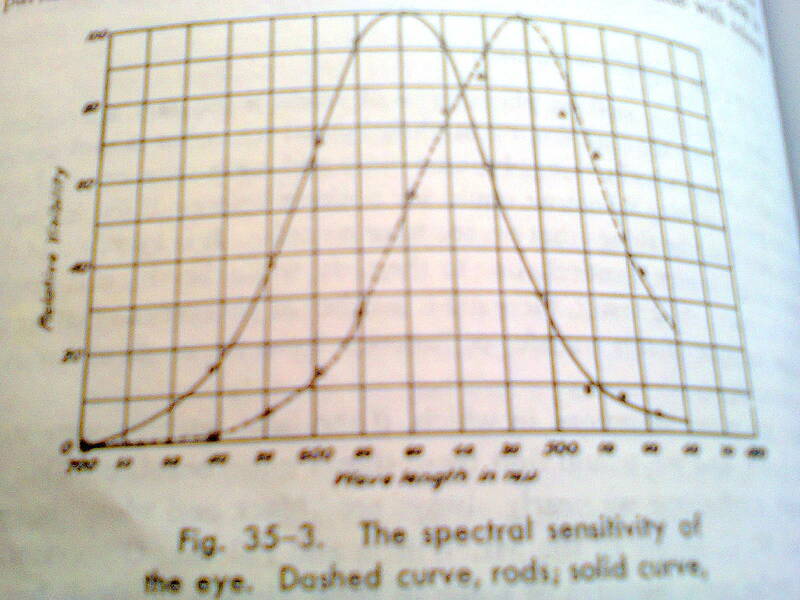 the dashed curve represents the sensitivity of the eye in the dark and the solid curve represents it in the light. the sensitivity of the light can be understood using the chromaticity diagram. "Darkness" is subjective, it simply implies a lack of the wavelengths of electromagentic radiation, aka light, that our eyes can see. Starting at the longest wavelength our eyes can perceive we can see red, orange, yellow, green, blue, indigo, and violet light. Anything with a wavelength longer than us humans can see is referred to as 'infrared', and wavelengths shorter are 'ultraviolet' which also includes things like X rays, radio waves, and gamma radiation. The reason we cannot see infrared or ultraviolet light is a matter of evolution, that is to say that there was no great advantage to being able to see these wavelengths. Many birds and insects can see ultraviolet light because it helps them find food, and the same goes for snakes being able to sense the infrared light given off by warm prey. For example many flowers have patterns visible only in ultraviolet that attract bees to their nectar and pollen, and some birds of prey can see ultraviolet light reflecting off the urine trails left by rodents scurrying along the ground. There are even a few humans that can see a bit of ultraviolet light, but it reportedly doesn't do much for them other than make colors seem a bit brighter in sunlight. Light exists in many wavelengths we cannot see, but those wavelengths do not constitute 'darkness'. Something that appears dark in visible light might be giving off light in a wavelength we cannot see. True darkness is the absence of all light, it cannot be transmitted or otherwise moved. These answers seem too technical. In layman's terms. Darkness and for something to "appear dark" are two different things entirely. Example: When you go in a closet with no light, you are in darkness. But your body still generates heat. That heat could be detected by certain instruments which would even allow you to see a shadow of sorts that resembled your body if you had the right equipment. Now more to the point of appearing dark. Compare a golf ball to a hockey puck. The golf ball us usually bright, like white or green or orange. In contrast the hockey puck is black and appears dark. This is because the bright ball reflects most light while the black puck absorbs visible light. If you put both of these in the sun for awhile you will understand what it means by saying "objects that absorb visible light reemit it as heat." The hockey puck will absorb most of the light that hits it while the white golfball will reflect most of the light that hits it. When you pick up both the hockey puck will feel much warmer than the golf ball. Not the answer you're looking for? Browse other questions tagged visible-light thermal-radiation or ask your own question. Why is there a line in the middle of the Planck full sky map? Why isn't light scattered through transparency? Why human and most of vertebrates cannot see Near-Infrared light (720nm-1500nm)? How come we can get mirror-like effects from dark surfaces?